The Mounted Retorti Ewer is a lavishly decorated ewer that originated from Venice, Italy. Although the artist of this piece is unknown the ewer was crafted between circa 1600 to 1625 A.D., most likely by a Venetian glassmaker in Murano. Murano is an island where, historically, Venetian glassmakers lived and worked on their craft. Even though this ewer is a very beautiful and carefully decorated object, it was actually endowed with the simple task of pouring water for the user to wash their hands during the seventeenth century. Standing approximately ten inches in height (including the high arch handle), about five inches in width, with a diameter of approximately three inches, one may definitely see that Venetian glassmakers possessed great skill and accuracy when it came to their craft. What makes this ewer unique in comparison to ones that existed centuries before is that it is a product of a certain style known as lattimo, which refers to making glass look frosty, as if it were like milk. Angelo Barovier has been credited (perhaps falsely) for inventing this technique around 1450, and it had great influence on Venetian glassmaking (Gordon, Concise Oxford Dictionary of Art). Today this Barovier-influenced ewer can be seen on display at the Los Angeles County Museum of Art (LACMA) on the third floor of the Ahmanson Building, in room 327. I chose this object amongst all others because it intrigued me. 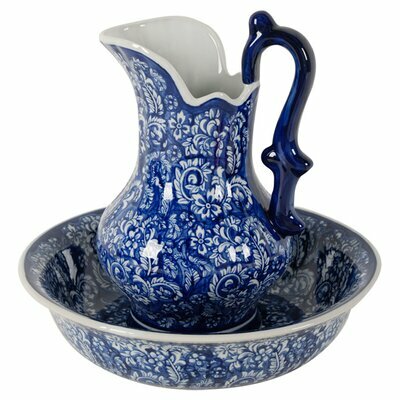 When I first saw the ewer I was surprised that it served for simple household usage. Personally, I felt that something this beautiful should only be on display and never used. Also, because I like math, it possessed many mathematical qualities that I enjoy, from the geometric frost design to the perfectly curved arched handle. The ewer is made of Venetian glass, silver, and precious stones. The glass is frosted with a white pattern of stripes and zigzag lines that course between the silver ring at the middle of the spout to the ring at the bottom of the mount. If one observes the ewer closely they will see that there are three patterns: a zigzag pattern that is layered with four lines and goes diagonally from right to left, another pattern that contains two zigzag designs, crossing one another, layered with two lines, and finally a simple stripe that separates the two patterns mentioned before and repeats across the body of the ewer. The glass itself is made out a material similar to rock crystal, which is comprised entirely of quartz, and is seen used in every culture and country including Venice (Kornbluth, Grove Art Online). Because of its naturally clear qualities one can imagine that constructing transparent glass from this material or something similar was not challenging at all. Cristallo glass is very easy to blow into various forms, which gives the Mounted Retorti Ewer its round shape. Along with the ewer’s round body, the ewer has a cylindrical neck that leads upward to the spout that flowers outward in three directions. The spout has an aesthetic similarity to a slightly ruffled fabric that is gathered by the silver band in the middle of the neck. The first ruffle curves outward towards the left, the second curves outward to the right, and the third curves outward facing forward where the water exits when poured out. As one look towards the bottom of the ewer they will notice that the round shape begins to converge in a ring-like gathering, which has a smaller circumference than the ring on the top. After the shape has converged through the gathering, the glass is fanned out in a small circular shape that makes the bottom. The circular edge of the bottom is covered with a silver band that has rubies mounted in it. There are also rubies placed in the band around the cylindrical neck and in the high arched handle of the ewer. Also if one looks closely at the handle they would also notice it curves outward and back where it is attached to the main body, and that there are two heads facing away from each other. One face looks like woman and the other looks like a man with a beard. It is not known who or what these faces represent in terms of historical or mythological figures, but they are likely well-known in Venetian culture. Image of Mounted Retorti Ewer taken at LACMA on iPhone. Image of Placard taken at LACMA on iPhone. Since the ewer is made with expensive materials it is highly possible that the ewer was created for the nobility or other wealthy or important individuals, such as rulers of a city (or of other provinces) in Italy or Europe. Another reason why it was most likely meant for a wealthy person, such as an aristocrat, is because the materials were not only expensive, but they were possibly imported as well. The silver, which is used for the bands and handle, were sourced from different parts of Europe. Also, by the seventeenth century, European exploration and trade in the New World opened up trade routes and the possibility that the silver could have been imported from Central America (Cooper, Concise Oxford Dictionary of Art Terms). The Venetian glass came from the island of Murano, but the most expensive detail, the rubies mounted in the handles and bands, mainly came from Burma, which is in Southeast Asia (“ruby”, Concise Oxford Dictionary of Art). The owners of this ewer would have not only used it for personal hygiene (such as washing one’s hands), but also as a symbol of their wealth and power. Considering the fact that the materials used to create the ewer were expensive and that the materials were possibly imported, in order for an individual to purchase such an object during the seventeenth century, that person must have been a well-off consumer. While the glass was created and molded by the Venetian glassmakers, the jewels were likely crafted and cut by jewelers, and the silver in the handle and rings were likely crafted by a silversmith. ​Although many of us today probably do not have Venetian glass ewers in our cabinets, there are still modern examples that are similar in shape and purpose to the Retorti ewer. The average pitcher has many similarities to the ewer. There is one pitcher on Wayfair called the Murphy Pitcher that has a few similarities in particular. It does not look like the Retorti ewer entirely but they both possess a high arched handle and a cylindrical spout. Although the Murphy Pitcher’s spout does not flower outward into three directions like the Retorti ewer the spout still has a decorated finish on the top. Also both objects have a round body that converges towards a circular finish. Finally, the Retorti ewer and the Murphy Pitcher are both decorated with beautiful designs across the object. 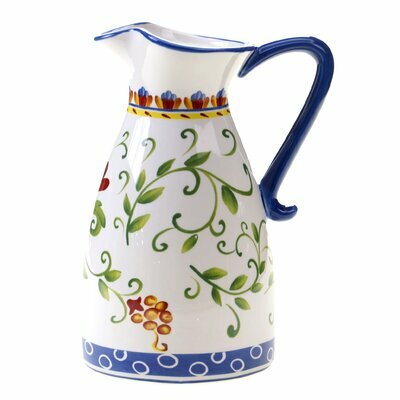 There is another pitcher on Wayfair called the Amalfi Pitcher that has one similarity to the Retorti ewer, and that is they both have a spout that flowers outward in three different directions. Although it does not look like a slightly ruffled cloth like the Retorti ewer, one part still curves out to the right, the other curves out to the left, and the last one curves in the forward direction where the liquid will exit. 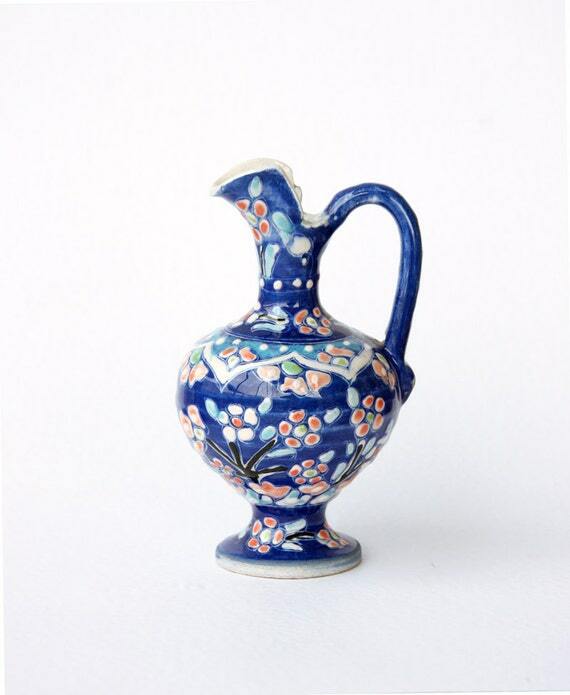 Also on Etsy there is another pitcher called the Vintage Turkish Ceramic Pitcher that looks very similar to the Retorti ewer. With an exception of the spout, the shape almost looks the same. Both objects have a high arched handle, a cylindrical spout (except for the top part), and their bodies are ovular converging in a circular vertex. Also the materials for both objects are designed to fan out into a circle shape at the bottom. Whether the ewer or pitcher was created in the seventeenth century or in the twenty-first century, the style of the Mounted Retorti ewer still has influence on household items. 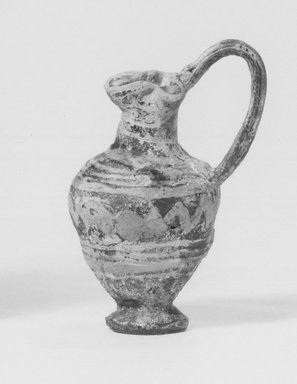 Roman Ewer in standing position on the Brooklyn Museum website. Mounted Retorti Ewer on LACMA website. 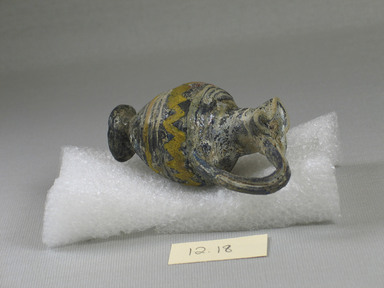 Roman Ewer image on the Brooklyn Museum website. ​​This ewer bears no official title and is not on display at the Brooklyn Museum in New York, but we do know it originated in Rome. This Roman ewer dates back to the fourth century B.C. Although the place of discovery is not provided, it resembles the Mounted Retorti ewer created centuries later, and it was probably manufactured in Italy. This Roman ewer has a similar shape to the Mounted Retorti Ewer. 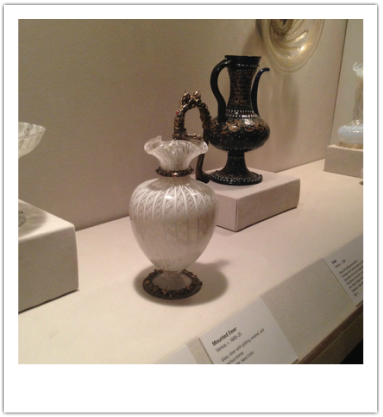 They both have a high arched handles, except the ewer from LACMA’s handle has a more circular shape to its arch. One reason for this difference is because the handle on the Roman ewer is made of glass, which is not as malleable as the silver handle on the Retorti ewer. Also, because the Roman ewer is much older than the Retorti ewer, one can tell that the glassmaker during the fourth century was likely following a particular design aesthetic that fell out of fashion later on. Along with the high arched handle, they both possess a cylindrical spout that springs outward in the same three directions. Both spouts look like a slightly ruffled cloth that gathers from the middle of the cylindrical neck of the spout and then vertically moves outward. The ruffles on each ewer curves out to the left, right, and forward where the water exits. The difference between the Roman ewer spout and the Retorti ewer spout is that the Roman ewer spout is not as refined and precise like the Retorti ewer spout. The Roman ewer and the Retorti ewer have the same ovular shape and the shape converges to the middle on the bottom. The remaining glass fans out in a circular shape to create the stand. Another component that makes the ewers different is the detailing, as the Retorti ewer has silver and rubies added to it. I chose this object to compare to my LACMA object because it is similar to the Retorti ewer but it predates it by about a millennium, making the Roman ewer an “ancestor” of the Retorti ewer. One of the main missions of the Italian Renaissance was the revival of Classical art, in particular Grecian and Roman influences. One may see how the Mounted Retorti ewer can look like a “revised” version of the fourth century Roman ewer. Calice di angelo barovier is one of Barovier's famous pieces. Angelo Barovier was a Muranese glassmaker who descended from a family of glassmakers, who lived on the island of Murano. Like his brothers, Barovier was a skilled glassmaker and is famously known for his invention of “Cristallo” around 1450 (Mentasti, Grove Art Online). Cristallo is a term to describe the transparent appearance of the glass Angelo created. By the seventeenth century, descendants of the Barovier family had traveled beyond Murano to different parts of Europe (Mentasti, Grove Art Online). 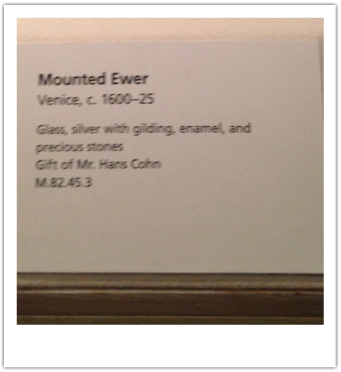 Knowing this, it is highly possible that the glassmaker of the ewer at LACMA could have crossed paths with one of the Baroviers in Venice or lived on the island with them. Also many of the Venetian glassmakers lived on Murano in a very closely connected community, where ideas and techniques were most likely shared with one another. It is here where the maker of the Retorti ewer may have been influenced. Barovier was most likely born in Murano circa 1400 where he took up his family’s profession of glassmaking. Barovier also received some form of education and studied under the philosopher Paolo de Pergola. Because of his knowledge and understanding of science, moreover, he was able to gain an in-depth understanding of glassmaking, which allowed him to create clear glass (Mentasti, Grove Art Online). Lattimo glass was also widely used during the seventeenth century, which is glass that is decorated with milky white vertical streaks that courses along the body of the glass object (Goy, Grove Art Online). Although it is suggested that Angelo Barovier also invented this technique it is highly unlikely since there is evidence that the technique was pioneered centuries before, but it is possible that Barovier’s use of this technique could have made it popular during the fifteenth century, and this technique influenced the maker of the Retorti ewer to use that design technique two centuries later. Coupe de Angelo Barovier is another famous piece by Barovier. Campbell, Gordon. "Cristallo." Grove Art Online. Oxford Art Online. Oxford University Press. Web.28 Nov.2015. <http://www.oxfordartonline.com/subscriber/article/grove/art/T2071616>. Cooper, John K.D. "Silver." Grove Art Online. Oxford Art Online. Oxford University Press. Web. 29 Nov.2015. <http://www.oxfordartonline.com/subscriber/article/grove/art/T078773>. Goy, Richard J., et al. "Venice." Grove Art Online. Oxford Art Online. Oxford University Press. Web.30 Nov.2015. <http://www.oxfordartonline.com/subscriber/article/grove/art/T088612pg3>. Kornbluth, Generva. "Rock crystal." Grove Art Online. Oxford Art Online. Oxford University Press.Web. 28 Nov.2015. <http://www.oxfordartonline.com/subscriber/article/grove/art/T072523>. Mentasti, Rosa Barovier. "Barovier." Grove Art Online. Oxford Art Online. Oxford University Press.Web. 30 Nov.2015. <http://www.oxfordartonline.com/subscriber/article/grove/art/T006472>. "ruby." The Concise Oxford Dictionary of Art Terms. Oxford Art Online. Oxford University Press.Web. 29 Nov.2015. <http://www.oxfordartonline.com/subscriber/article/opr/t4/e1473>. Thornton, Dora. “A Documentary Venetian Renaissance Dish In The British Museum.” Journal Of Glass Studies 51. (2009): 76-85. Art Full Text (H.W.Wilson). Web.28.Nov.2015. "Venetian glass." The Concise Oxford Dictionary of Art Terms. Oxford Art Online. Oxford University Press. Web. 28 Nov.2015. <http://www.oxfordartonline.com/subscriber/article/opr/t4/e1739>.